This isn't happening every day: a direct goldmaking post. Blizzard mostly marginalized trade, allowing every living body to get anything from farming badges eternally. Of course you can make gold from flasks, belt buckles, gems, enchants and such everyday items or transporting between factions but it's not easy at all to find a new niche market. I managed to find one though. Toravon the ice watcher is the last boss of VoA, dropping ilvl 251 PvE and PvP items, mammoth mount and frost badges. So he is frequented by PvP-ers and non-raiding people (real casuals, newbies and M&S). Haven't heard of any serious raid guild organizing raids there. If one wants something from there, he must organize a PuG. Considering what kind of people frequent Toravon, these PuGs are often terrible. Tank being in the top 3 DPS is common. Considering that he has a stacking debuff on everyone increasing frost damage, low DPS can easily make wipe. So far so good, but where is the gold? Please look at what Toravon did to this tank on a successful kill: 745K damage, only 160K melee, rest is (79%) frost damage while frost aura was active. So? So you can sell frost res gear to tanks who frequent Toravon. Simply check /who Vault, whisper someone in the raid, ask who are the tanks, then whisper the tanks a macro reminding them that most damage they get there is frost (encourage them to check their own recount) and mention them you are selling frost resistance gear on the AH. You can also spam trade with something like "Tired of wipes at Toravon? Buy your tanks frost resistance items and you'll never wipe again!" What can you sell? As a BS, icebane chestguard, girdle and treads to plate tanks. As an LW, polar vest, cord, boots to bears. As a JC titanium frostguard ring to everyone. As alchemist lesser flask of resistance to everyone. After a couple of wipes your wares will start selling. Don't just list them silently, most people have no clue that they need it! I got lot of comments saying "no one needs that gear". I deleted half of them believing they are trolls and just after some non-anonymous commented it I realized how big the problem is. People, come to your senses! What will be the next? You'll claim that one can't sell Ice Cold Milk, Simple Flour or arrows in stacks of 10?! Of course a decent raid doesn't need it. But what about the lolling M&S and mostly, those socials who boost them? They never fail! They are just undergeared. Go and supply them with gear! Ganking note: the guild has drastically increased its skill in raiding since the shameful ToC raid. Toravon 25 done with 2K DPS PuGs and 2 bosses in ICC25 with similar pugs. I'm honestly surprised how fast we learn from mistakes. So one more reason to join (if massacring the horde is not enough). PS: sorry for not continuing the "normal distribution" topic, but I won't be able to manage comments in the weekend. Don't know what its like on the EU but this will never work on US servers. I've bought people in mostly blues to toravon and didn't wipe. Umm, on the two servers I frequent (neither of which are very progressed in general), wipes on Toravon are incredibly rare, even for M&S-filled pugs. Perhaps it's different on your realm, but where I play (Detheroc-US Horde), VoA pugs are commonly very well done single-shot attempts (generally no frost gear used, as most characters are well geared and competent, and therefore he goes down before the debuff gets bad). The worst problem is the few ranged DPS that like to stroke their egos and focus on the boss instead of the orbs. I've never seen tank being anywhere near the top of the damage list. Anyway, the main groups that frequent VoA seem to be PvPers and slackers who want free tier/PvP gear (as you say), but also raiders who want to maximize frost badges/week or 10-man-only raiders who want a shot at 25-man tier. As long as there's enough of the latter, things go smoothly. I can't speak for your server, but on mine I would probally make as much money doing this as I would trying to monopolize frost lotus. On my server (pvp)even the most retarded pugs on the server will be able to down toravon. This includes tanks that cant taunt and dps that won't touch the orbs. If the group somehow manages to wipe and the M&S quickly find another pug to carry them. However most groups fown him without a hitch so the repair cost won't justify the cost of frost resist gear. What the other commenters said is also true on Vek'Nilash EU. When I saw the post title, I was sure you would write about another way of making gold with VoA: basically, needing on every piece you can use (regardless of actually wanting it or even having it), then selling it to another needer. On Burning Blade(EU), you can't get into VoA with low gear, because *every* leader requests Gearscore. Of course, wipes still happen thanks to morons not damaging orbs, but they are very rare. Noone would buy FrR. Maybe, if he'd be tanking Sindragosa, but majority of PuGs can't even get to her. what on earth kept you from doing the lootship event? Did you get the Bone Giant weekly and fall apart from there? Isn't that a little bit risky? I mean: if you offer to sell the stuff you'll prolly get called on it and eventually get a bad name for yourself, which is usually bad for business. I also don't think anyone on my server would buy the frost resist stuff specifically for VoA. Oh, and little known fact is that the trash before Toravon also does frostbite. And some random target hard-hitting thingy, which sometimes kills a lot of people with low hp. I always have some fun watching how the tank of the first guy that died never, EVER, taunts the other tank's mob* and one of the tanks ends up dying from the debuff that the healers didn't heal because they are slacking after the mobs are dead. I think people are strongly underestimating the amount of damage that a full frost resist set can mitigate. in a 25man raiding guild, we frequently called for DPS to stop, just to see how high we could get the stacks on a kitted out tank. (Died on the 37th stack). 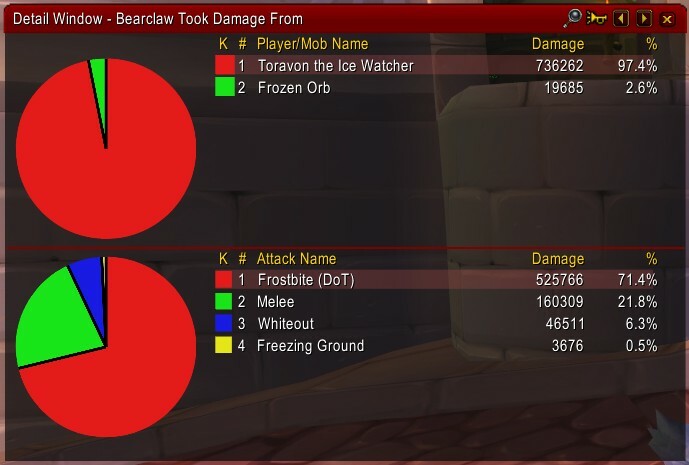 Regardless, frost resist gear on the tanks completely trivializes the healing required for the encounter, as long as the raid doesn't get oneshot by a whiteout due to slow dps. "there is no wipe in Toravon" people: this is why I am goldcapped. I notice niches, you claim they do not exist, simply because you are not in it. Obviously no decent raider guild would ever wipe on Toravon. But we are talking about retarded gearscore-demanding PuGs led by people who's Storm watcher tactic is "AoE them fast". Just because you are not in this pug, claiming they don't exist is stupid. Frost res gear halves the tank healing demand, letting healers heal the orb-dancing retards. First time reader and poster. Been reading your blog today, I really like the Udergeared project, it is the most substantial contribution to the gear-skill discussion. I have wiped once on Toravon 25 man and never on 10 man. The server you play on must be incredibly crap, and I suddenly understand your despise for M&S (or the players who enable them). I agree with the other posters, if I tried to sell frost resist gear for toravon on my realm (zul'jin) Id get bashed into the ground so hard by all the elitist and even non elitist. Everyone would think I'm trolling. It would be hilarious. The fact of the matter is that if your tanks are undergeared enough to make that fight difficult, using the resist gear would make them so far under the 540 def cap, cuz they are itemized so terribly. Is there even any fight that could justify dropping so much defence to risk getting crit-jibbed to cut down on elemental damage in this xpac? I'd take a < 1% chance to get crit anytime if that meant better overall mitigation. Hmm, no offence Gev but on Moonglade EU I do VOA pugs 6 times a week (3 80s, 10 and 25) and I dont think I've seen a wipe in... well, since week one or two. Not a bad idea, but even most retarded gearscore clueless people stopped wiping Toravon two months ago. I see alot saying why this is a bad idea but is anyone suggesting alternative cash making ideas? Has anyone ever tried doing this with success or not because saying it DEFINITELY won't work without trying it seems .... Lazy. So to those above plz tell us your good innovative idea of making money? PLZ. Ok, an indirect jab at the undergeared project. While skill certainly beats gear, being hysterically overgeared certainly allows you to cheat. You might also have luck selling these on the AH for the Sindragosa fight. Most tanks that are in semi-serious guilds still have their frost resist set from Hodir, but this being the last patch before the expansion I've seen a LOT of alts pop up, and those alts have not done Hodir and will need the gear for Sindragosa once the buff makes them able to get that far. Again as many have said, I have been in some terrible pugs and we still get him down, yes even without the "leet 5900 GS" people. The fight is so trivial, and easy that even the M&S lame brains can do it with no problem without the frost resist. this was a good gold making strat for Naxx, not VoA. Also, you make it sound in your comment that becasue you have hit goldcap, everything you say will work 100% guaranteed, not the case. I currently play on one of the worse servers in US and my faction is less progressed. I've never done VoA with a guild, the closest I came to not pugging it was running it with some friends. I've wiped on Toravon twice. Once in 10 man when our boomkin didn't pay attention and switched to resto, so pally healer was solo healing until damage got too much (about 35% health left on boss) And once on 25 man, when only one or two ranged were switching to orbs, so raid damage got too much. also, you have misinterpreted the mechanic of the fight. stacking debuff is put on a tank currently in possession of aggro (it takes approximately 4 stacks of the debuff before OT loses theirs, at which point they can taunt). A single paladin healer can heal both tanks. there is no persistent frost damage aura, there are 2 AoE attacks - whiteout that damages everyone (has a long cast time, so healers can anticipate it) and frozen ground which does mild damage to select target while freezing them to the ground (spreading out limits the number of targets he can freeze) Frozen orbs (1 on 10 and 3 on 25) that he summons have a short range AoE attack, but since they often pop up on top of melee, they often get caught in cleave attacks and die faster. Lastly every VoA I've ever done, has at least several raiders in it, there for a shot for faster offspec tier gear. 25 man especially, that drops sanctified version of it. Maybe its becasue I select my groups with more care? Time being money I would rather spend 15 minutes one shotting a boss and skipping a dubious sales opportunity via frost resist gear then spend 40 minutes to an hour in a failing group that may or may not kill the boss where I may or may not sell a few inexpensive epics. repair bills and time lost make it not worth it. 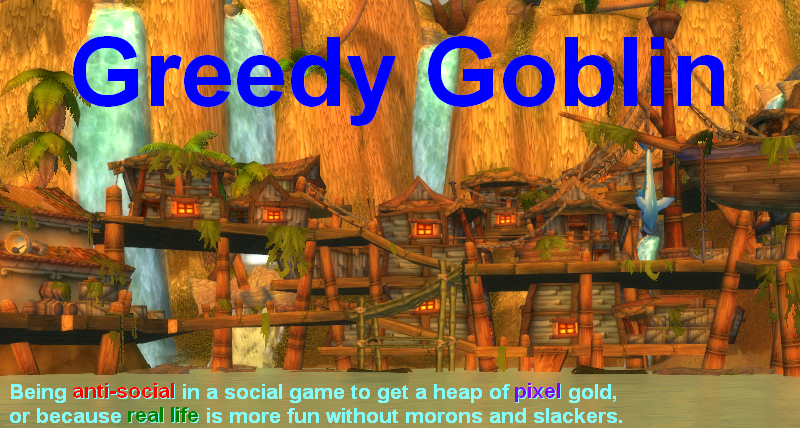 As I see more and more of your gold-making ideas, I can only conclude that you play only on realms with a strangely stupid population. I've not seen a GS check for VoA in a long time, nor a wipe. There have been wipes, but they tended to be of the, run back and tell the ranged to kill orbs type; no kicking of 'undergeared' people. Why are you selling the gear? I don't imagine you need more gold. All it does is provide additional evidence that gear can fix problems, implying to the buyers that lack of gear is the problem. Within the small scale you're undermining the undergeared project's lessons; worse if you convince others to imitate your marketing. Boy, a lot of naysayers without a shred of proof. Yes, you'll have to do some selling on this to build up demand. We'll have to be salesmen! Horrors! Gevlon's right: The smart merchant finds niches where others say there are none. And there might -- might -- be a niche here that's worth exploring. The trick would be to convince the tank that it's necessary and worth the time/money. Play up the lousy state of DPS in trade chat. Put out feelers to find failed VOA pugs — I don't care what server you're on, SOMEBODY is screwing up — and seek out the tank. "Wasn't your fault, I know, but frost-resist gear would help you survive noob-dps. Save you some repair." can you even resist frostbite? I'll tank him in my sindragosa set (~400 FrR) and see. However, I believe I have never seen a resist/partial resist to frostbite. Whiteout; yes I have, but frostbite, uncertain. I think this is a risky market to enter into with Cataclysm so close on the horizon. Frost Resistance gear was at its peak during Naxx for Saph attempts but even then was not completely needed. I'm not saying this market isn't worth trying out but I wouldn't invest too heavily into it, one set at a time. The minute word gets out about cataclysm being released you can count on everything in the market taking a serious dive. I see no mention of profit per hour in this article. I can believe there is gold to be made, but it sounds like a time-consuming business. If it's no better than doing dailies, I'd rather spend my time talking to npc's than failpug members. I also can confirm that when I make VoA25 pugs without requirements and a 10 sec debrief before we start we never ever wiped on this lol. Ur server must have the most horrible progression ever lol. @ naysayers: whether or not he can profit from selling frost res gear is an empirical question. Let's see some data. Of *course* everyone inside is monumentally stupid. If they weren't they wouldn't be wasting time on it. I've only ever seen one wipe on Toravon (that I can recall) and that was due to my co-tank failing to taunt-swap out of ignorance and the inability to answer "yes" when the raid was asked if anyone needed a quick run-down of this boss fight. Sindragosa, on the other hand, is a situation where Frost Resist gear is quite helpful to the entire raid given the amount of Frost damage she puts out. The only problem with that niche is that once she's downed, there's less need for the FR gear, so only guilds that are about to attempt her or are currently stuck on her will be likely to bite. Still, it's a much larger niche than the one for Toravon. Also an increasingly fragile niche, as the ICC buff ramps up. As with all things market-related, the timing is important. It may also be that tanks are grabbing frost resist gear for Sindragosa. When you mention selling arrows in stacks of 10 I shudder. These are a con and a low form of trading. Are you saying selling the resist stuff is similar to this or are these items good to use and not a con? How can you sell gear to people saying you need this and then say you don't need them. Surely you destroy your own market! Hint. If the person selling tells you these are no good don't buy. I do not see a steady source of lazy fail tanks who are willing to buy, chant and gem this gear. But hey, prove me wrong. Show me steady sales. I hear you can get Sanctified in ICC10. The "organization" takes 10 minutes after a reset. I have seen one single wipe in VOA since Toravon launched. Winning VOA is not something I have to worry about, because PvPers will do that for other reasons. A 2-boss clear takes 15 minutes, which is about how long a longer heroic can take, and the reward is the same two badges, plus a chance at Triumph or Sanctified tier. This is not a niche market. The volume you'll sell this junk in is going to be abysmally small even on a high-tard server, and not worth the time spent on the sales pitch. Being gold capped is not really as big an achievement as you like to think. Most people aren't gold capped because they don't care to be. I've raised tens of thousands of gold in a few weeks of actually bothering with the economy, if this was my raison d'etre in this game, I'd be capped several times over by now. Sorry, but your article just seems like some nonsense you dreamt up, like a wow.com "contributor" trying to meet his post quota for the week.